We have a 298 Massey tractor (pride and joy of our fleet) lol that we need to change the alternator. I meant to take a pic earlier but I forgot so will try my best to explain. It has a plug with three connections and one terminal off to the side by itself. The plug connections have one wire that goes to the dash light, then the other two have wire each that goes directly to the starter, which goes to the positive post on the battery. Now my first question is, should both those wires go to the same place (starter) or should one go somewhere else? Seems funny to run two separate wires to and from the same places. And my next question is, where should the terminal by itself be connected? It originally had a black wire connected to it that upon further investigation went to a connection in the wiring harness but went nowhere from there. We have decided to rewire the charging system because the last owner has pretty much butchered everything he touched. Sometimes easier to start from scratch, but not when you don't know how it should work! Well in the case of the oh so common GM delco "1 wire" alt the hot rudders special. There are actually 3 connections. Then the 2 spade connectors with lighter gauge wire are for the charging light and regulator sensor wire. The indicator light is grounded through the alternator. There are options for the regulator voltage sens line. 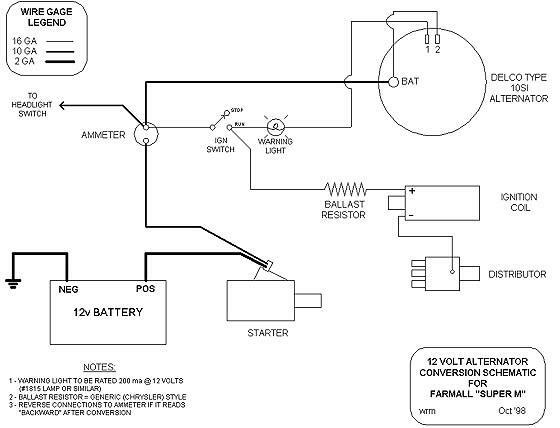 They're called a "1 wire" because the indicator light terminal does not need to be connected and the reg sens line can simply be looped to the heavy output terminal of the alternator.... now IDEALLY the reg sens wire should go directly to the battery, so the battery itself gets the correct voltage regardless of poor connections between it and the alternator. Not sure if you have that alternator, they're quite common, but what it comes down to is typically you have a heavy charge current carrying wire direct to the battery. A lighter gauge wire connected directly to the battery for voltage regulator. And another lighter gauge wire that goes to ignition to "turn on" the alternator. [The gm delco are "self exciting" so the "turn on" wire is omitted. Just keep in mind it's very rare a circuit ever works as the one in the picture. More often than not wire 1 will require a charging system diode. This is how I converted my Cockshutt 535 combine from generator to alternator back about 1975. 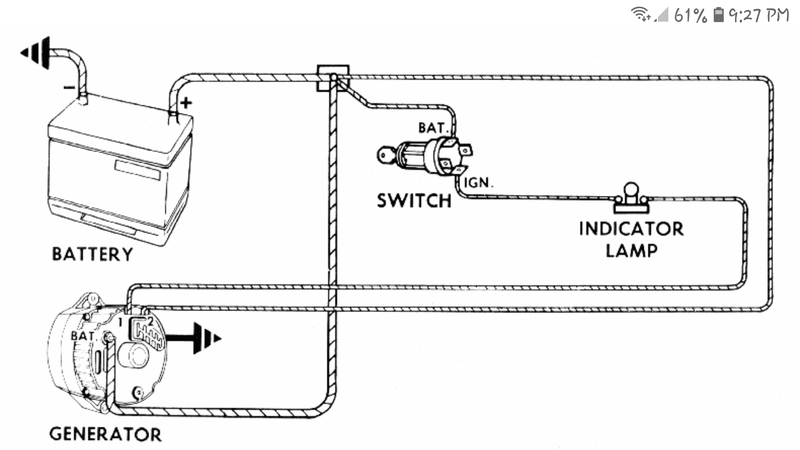 I was advised to put a 10 watt 10 ohm resistor where the warning light is in this diagram. If your talking about the common delco alt, I sure you still need to loop the reg volt sens terminal to the Alt output terminal...... it's a short wire, but regulator still need to know voltage. I just grabbed a quick pic last night [I did see some with, some without the diode] was not paying attention. What's the purpose of the diode anyway? I have installed a delco without the diode and light actually just using that terminal to "turn on" the alt straight to ign......?? #1 this is the post I'm unsure of where it goes. 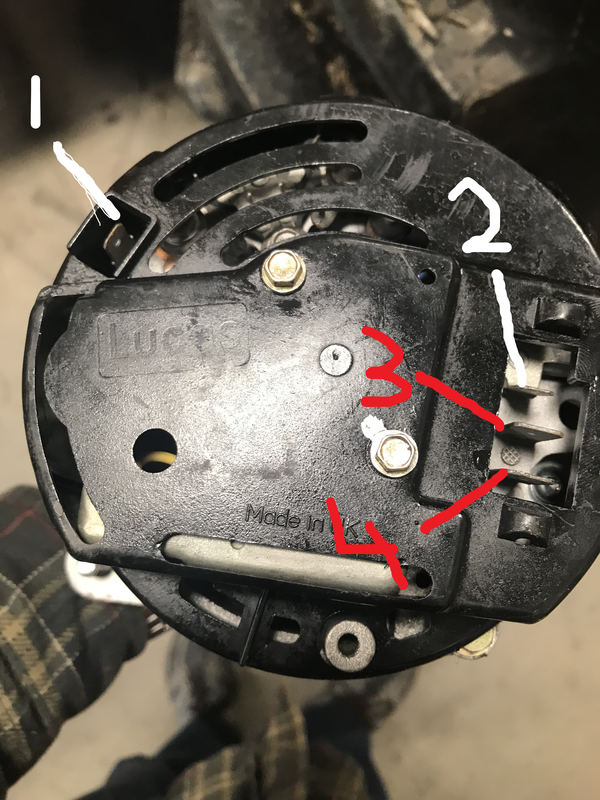 #3 and 4 both have their own wire that goes to the starter/battery, assume this is done to handle the high current? So should #1 go to the ignition with power only with the key on, or can it go directly to the battery power? Not sure if this will be helpful or not.